If a program seems slow, you can check to see whether it’s running in Rosetta by opening System Profiler (/Applications/Utilities). In the list on the left, click on Software and then on Applications. You’ll see a list of all your applications—currently running and not. If a program can run in both modes, the Kind column will read Universal. 2. Application Failures Some PowerPC programs won’t launch on Intel Macs, even in Rosetta. A few launch successfully but some of their features won’t work. At press time, this included important programs such as Microsoft’s Virtual PC, and disk-repair programs such as Alsoft’s DiskWarrior and Micromat’s TechTool Pro. You shouldn’t even attempt to use a non-updated disk-repair program on an Intel Mac. Wait for the software company to release an Intel-compatible upgrade. 3. The Classic Vanishing Act The Classic environment no longer exists on Intel-based Macs; there is no Apple-supported way to run Classic programs anymore—period. 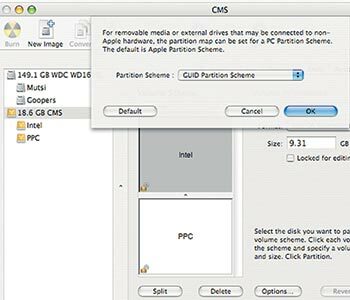 Reformatting Required If you want an external drive to be able to boot from an Intel Mac, you need to reformat it, via Disk Utility’s Partitions tab, and select the GUID Partition Scheme option, as shown here. 4. Drives That Won’t Boot If you want to be able to boot from an external drive when you’re using an Intel-based Mac, you should reformat the drive, using Disk Utility’s Partition tab. Click on the Options button and select GUID Partition Scheme (see “Reformatting Required”). This option is available only when you run Disk Utility on an Intel-based Mac and when you select an external volume. You need to do this only if you want to be able to boot from the volume. You will also need to install an Intel-supported build of OS X on the drive. For example, at present, there are two versions of OS X 10.4.5—one for PowerPC Macs and the other for Intel Macs. On my Power Mac G5, the 10.4.5 build number is 8H14; on my Intel iMac, it’s 8G1454. If you’re running OS X 10.4.4, there are separate PowerPC and Intel updaters for each platform. Quit Safari and open its Get Info window in the Finder (click on the application icon and press Command-I). Choose the Open Using Rosetta option. The next time you launch Safari, it will open using Rosetta. You’ll lose the Intel speed advantage, but at least your plug-in will work. If you have similar problems with another Universal application that uses plug-ins, the same solution should work.